Since the death of Colonel Gaddafi, there have been scenes in Tripoli which would have been unthinkable just a few months ago. His Bab al Aziziya compound has become a sort of tourist attraction where civilians mingle with the heroes of the revolution. 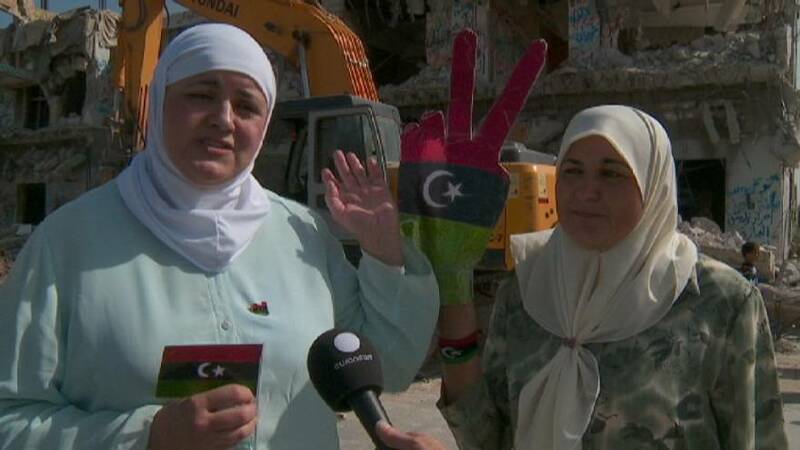 Many people came to watch the demolition of Gaddafi’s ruined houses. For them it is a powerful symbol. Building a united country on the rubble left by the revolution is a crucial test for Libya, where reconciliation between rebels and former Gaddafi supporters has hardly started. Demilitarisation, and handling inter-regional tensions and tribal rivalries are also challenges. The plan is for an interim government to guide the country’s reconstruction alongside the NTC, before elections in eight months’ time for an assembly which will draft the new constitution. Until then, it will also face the hard task of ensuring security and stability. People from Marzouk in the south of Libya, about 1,000 kms from the capital, held a demonstration in Tripoli. However many black Africans have become collateral victims of the Libyan revolution. Just over the Tunisian border, the Choucha Refugee Camp is the last one left in the region. There are still around 4,000 people in the camp, many of them from sub-Saharian Africa. Because Gadaffi used black African mercenaries during the revolution, all black Africans – many of whom have lived in Libya for years – have become suspect. Now, they risk being ill-treated, arrested or even killed by revolutionaries tracking down mercenary soldiers. Some people have only recently arrived in refugee camps. Rania Adriss and her family are originally from Sudan, but they have lived in Libya for nine years. Now however, in the uncertainty and chaos of post-revolutionary Libya, it is impossible for them to stay. For many of these people, and for Libya itself, the future is uncertain.